Converted from mountain to road biking a year ago. I bought a specialized allez elite about a year ago. I have upgraded wheels and have been thinking about upgrading to a compact crank. Components are Tiagra and 105. So, my friend was moving and had an old 600 crank that he said i should try. The crank is like new in the box from years ago. Is it worth using this old crank? Since I already have 105, I was going to purchase all 105 components. How old is 600? Any suggestions? 600 is good stuff - Ultegra line before they named it Ultegra - but I don't believe they made a compact crank back in that era. Maybe the chainrings were changed? 600 is circa 1992 I believe that was the last year they were made? Ultegra grade, you are correct. Check the rings, it will likely be 52/43. I am sure you are well aware it's two piece crank, so ext bottom brackets are out...I will stop talking now. 1993 was labeled ultegra 600. I bought a Cannondale in 97 (R-900 model/8 speed) that was fully equipped with 600 components,cranks, brifters, hubs, dereailleurs. The cranks are still in use and work great. along with the hubs and front derailleur. Brifters are shot and the rear derailleur was not the same after a drop. But I don't think anyone had compacts back then. It was a maroon frame before the shop idiots damged the original frame. Crank is original 600 with about 20,000 miles and still smooth as butter and currently in use with 9 speed. Last edited by Mr. Beanz; 11-06-08 at 12:52 PM. Love my 600 stuff. Still use the crank on my Fixed Gear. Can't get myself to part with the rest. Soft spot for it. It was the first full group I was able to buy. Went on my first "real" build back in 1990 or 1991. 600 with D/A seatpost and headset. ^^ - 600 7-speed with biopace. Nice. Sold a group like that this summer. If it's a tri-color 600 crank, it's sought after by C&V types. If you're not familiar with the tri-color logo, you can see it in Psimet2001's pic of his rear dr.
EDIT: I have 600, 8 speed brifters. Of all the 8 and 7 speed brifters I have, they are clearly the best shifting units. Still smooth after all these years. seriously? the tricolor 600 ultegra? yep. and to think someone left that bike on the curb as garbage. I had to put a lot of work into it though. I'm still riding and racing on my '92 RB-1 with 600 and bar-end shifters; although, I suspect I'll be racing in something different starting in March. It was called 600 until 1993; I think thats also the year they gave it STI shifting. They changed the name to Ultegra 600. Then in 1998 when they went 9 speed they changed the name to just Ultegra. Not the 1984 set I have on an old C'dale touring bike. It is 130 mm BCD and was really old school: it came half-step (50/45 in front and very widely spaced in back). I have converted the front to 50/39 and put a more reasonably spaced freewheel on the back, so the long cage RD is a bit of overkill. It still shifts like a dream. WAY better than Campy of that era. The headset nuts are very bizarre looking and they did make a special tool for them, but a regular headset wrench works perfectly. It's likely you would have to buy a new bottom bracket, and you may have other issues. I like the 600 stuff a lot. My singlespeed commuter has a 600 crank, and one of my road bikes has a tricolor 600 group. It's good stuff, but I just don't see any point in trying to make it work with newer components. Nope...I had the option of buying integrated levers when I bought the group in 90 or 91. Very specific on the time because of a lot of factors.... In 1993 I was in college. In 1992 I was not. I rode the rig for my whole senior year of HS so that means it was available in late 1991. I bought the group from Performance through their catalog. There was an integrated lever option. I can still remember reading the price and thinking that HAS to be a typo! 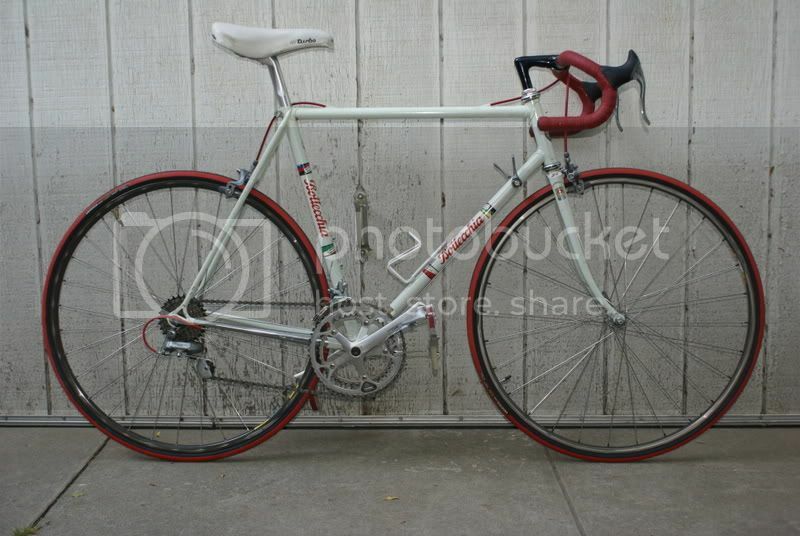 For the record IIRC it was called 600 Ultegra as well in that catalog. She needs to flip it big time. My schwinn has 600 and it's nice stuff. All times are GMT -6. The time now is 11:11 AM.